Welcome to the beginning of our Fall CSA! It’s hard to believe it’s already October but we couldn’t be happier to extend our season for another few months into the 2013 season. With all the mix of sun and clouds of late we’ve been able to get a lot of work done on both farms. Putting our beds to rest, shucking garlic for a fall planting, harvesting the rest of our winter squash and rolling up irrigation lines until we need them next season. We haven’t had our first frost yet which means that things are growing while they still can. Everyday we are losing a little bit of light which means the plants, the animals and the farmers have to slow down just a little to reserve their energy for the winter ahead. 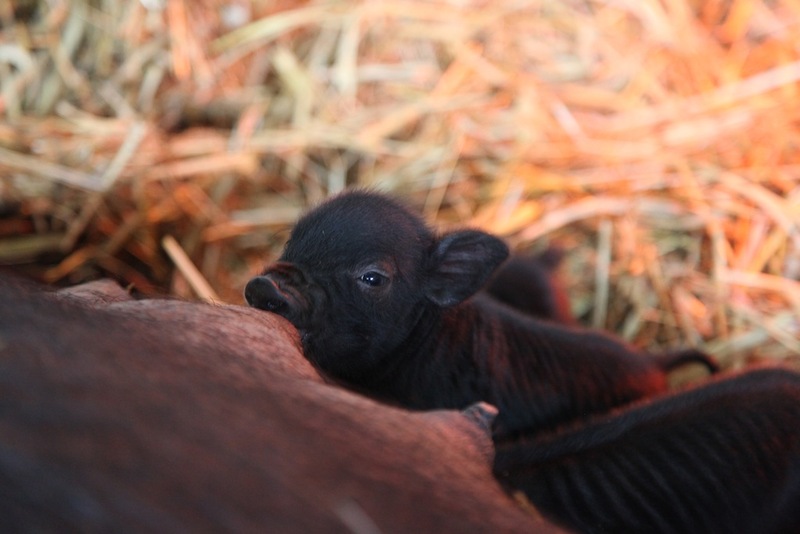 The piglets are here! 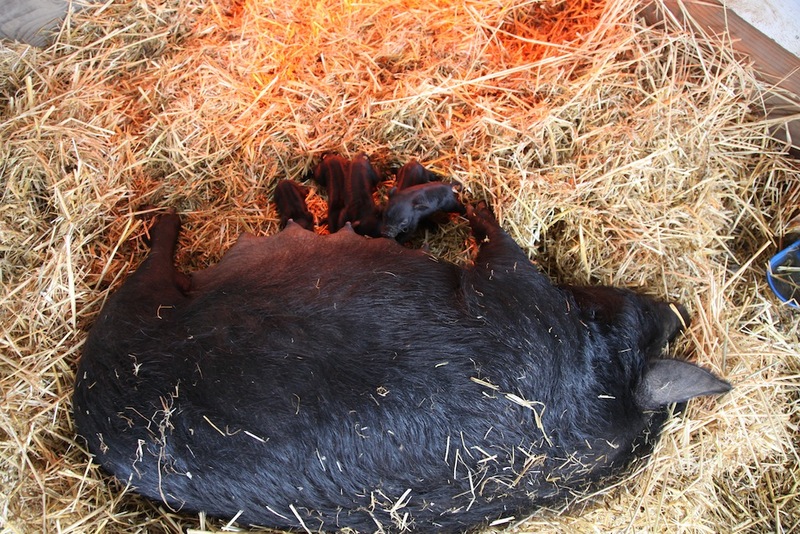 Our sow Truffle had her first litter of piglets during the ‘tail end’ of the CSA drop on Thursday. They sure are an adorable bunch (the little girl even has a spotted pink nose). Ellie & Maribelle stood outside Truffle’s stall chewing their cud to watch the new piglets in action (too funny). The first few days were long for us – checking in on mom and babies to make sure everyone was a-ok and getting what they needed. At first we thought Truffle had a bout of mastitis but now we believe she just hadn’t let down her milk (a farmer friend informed us that first time pig mamas can sometimes take up to 3 days to let down their milk). After a few sleepless nights things seem to be going well. Truffle has been a great mama through it all. The animal barn will be closed this week to visitors, as we want to keep the stress factor down for mama while we all adjust to this new change. Thanks so much for understanding! How the CSA works. For those of you who are new to the CSA – WELCOME! We are so excited to meet you and your families and to feed you for the next few months. For all those lovely folks returning, and for those we’ll see back in the Spring we appreciate all the goodness you bring to the farm and hope you all enjoy the bounty ahead! Have fun with food! Get creative & be inspired. Ask questions & be open – you’ll be surprised what you might find as the season unfolds. Past members have suggested going to the grocery store after you have received your crate. It saves you trips and also may save you from going to the grocery every week (your farmers know that you always leave the grocery with way more than you intended) thus cutting down on food costs! We include weekly recipes with the box that guide you through that week’s bounty. 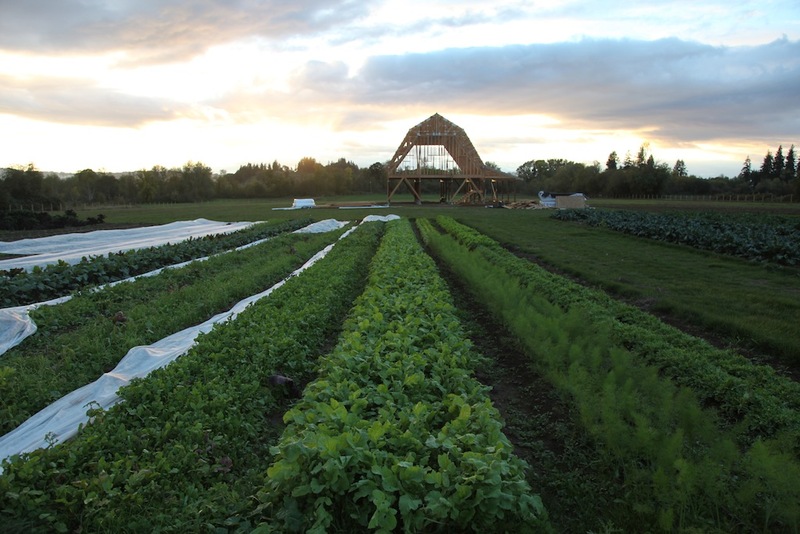 We grow over 60 + types of vegetables and fruits over our 28 week season – all brought to you during their peak ripeness – and “time” in the season! 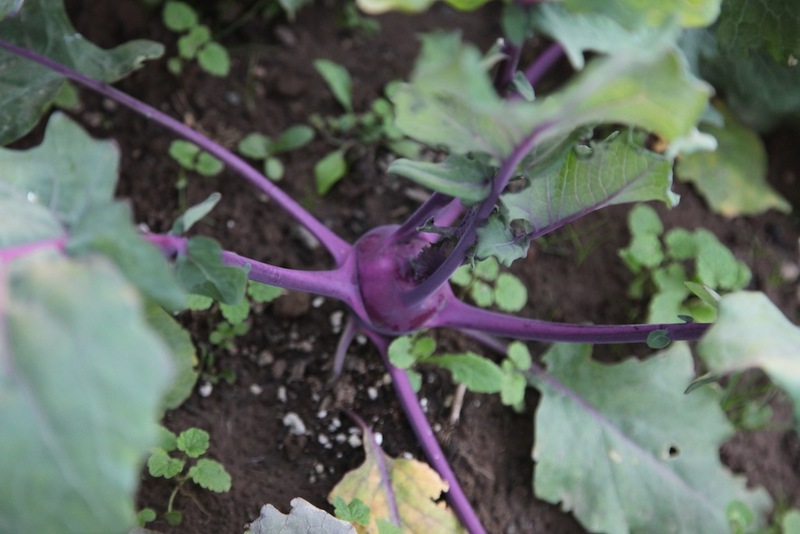 We grow several varieties of each kind of veggie/fruit which makes for 100’s of delicious varieties to enjoy throughout the season. Pick-Up times. We sent out emails last week with your pick up day and time and location. Please let us know if you have any questions. On your pick up day just follow the sign where you will find parking between the greenhouse and the white barn. We’ll have pick ups in the shade structure until the weather turns and we’ll leave a light on for folks who come from 6-7pm. Your farmers will be available at Fall pick ups from 4-5pm to say hello, answer any questions, take part in food related chats & general farmyness, share recipe ideas etc. If you are unable to come pick up your share, you can either arrange for a friend or family member to pick it up for you or give us 24hr notice and we can donate your box of goodies. All unclaimed boxes will be donated as we don’t have any means of storing them (i.e. refrigeration) on the farm. Crates. 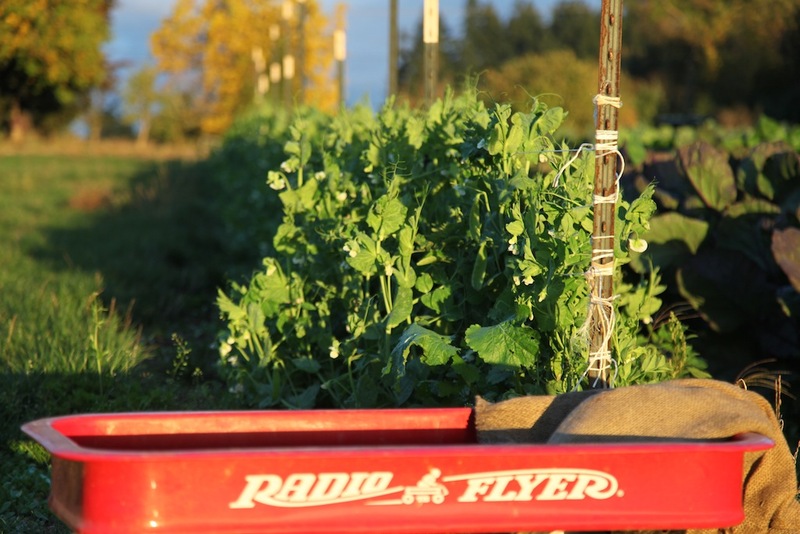 Our CSA crates are hand built (by your farmers) as the hope is to use them for years to come. We believe this to be a more sustainable practice as the alternative (cardboard, paper etc) only last a year or two – not to mention we love the aesthetic and nostalgia it brings together with all the fresh bounty nearly toppling out of it. It is an extra thing we do for the CSA (at cost to your farmers/farm) and we love it. In order to keep producing crates, it’s very important to return them each week. It’s one of those things that makes a huge difference to your farmers in performing at our highest efficiency as it’s just the two of us harvesting for 25 families everyday (if we don’t have enough crates there is nothing to put your produce in.) Past members suggest leaving it in the trunk of you car, or by your back door (so you remember to grab it.) It’s a small but very important role that you play in order to make this CSA flow smoothly! We thank you in advance for helping us in that regard. Compost. In keeping with a more sustainable farm model (and since everything in nature moves in circles) we will be keeping a few bins at the farm pick ups for our compost pile. If you happen to have any leftover greens, tops, bit n pieces etc from Working Hands Farm produce waste (please, only waste from our farm) feel free to bring it in your own container and empty that container in the farm bin provided. Reduce, reuse, recycle. For all those who purchase eggs or buy eggs at the store we reuse our paper egg cartons! Please save up your egg cartons for us and return them (please no plastic or styrofoam.) We also reuse all berry boxes (1/2 pints, pints, quarts) so you can return those as well. 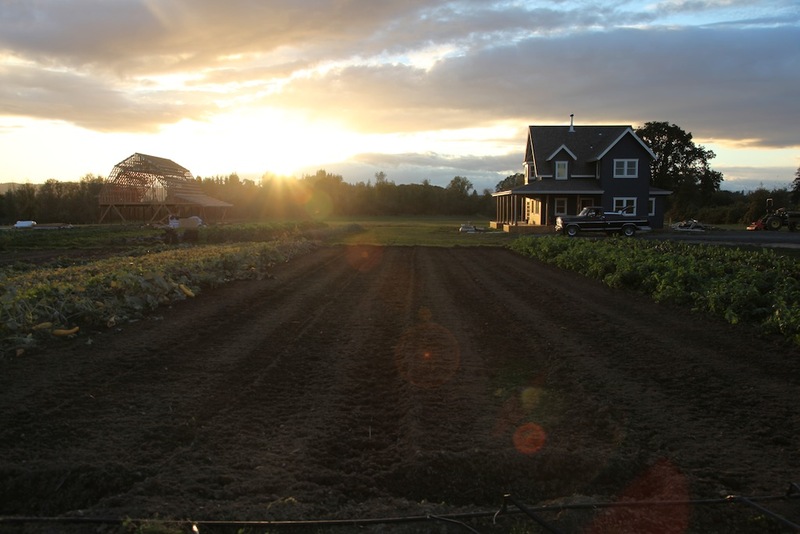 We are a thoughtful farm in terms of minimizing waste and reuse what we can! We look forward to seeing you all this week! Be sure to check out this week’s farm slideshow for more adorable pictures from around the farm!